Ventura, Calif., February 12, 2019 – Peoples’ Self-Help Housing (PSHH) President/CEO John Fowler has been appointed to the Ventura County Housing Trust Fund Board of Directors and will lend his expertise in developing affordable housing to benefit the area. The Ventura County Housing Trust Fund is a 501c3 nonprofit that supports affordable housing efforts by generating and leveraging financial sources, many of which are not traditionally dedicated to housing. The Board of Directors are responsible for ensuring a high quality program and care over all aspects of the organization. Fowler has led PSHH since 2014 and is responsible for guiding the nonprofit organization’s efforts from development and construction to property management and supportive services. 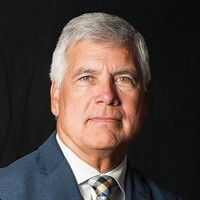 In addition to being a certified public accountant, Fowler serves as Chair of the City of San Luis Obispo Planning Commission and has previously served on the board of directors of the City of San Luis Obispo Cultural Heritage Committee, Newman Foundation Board at Cal Poly University San Luis Obispo, Mission School Memorial Foundation, and Noor Foundation Board. He is also past chair of a City of San Luis Obispo Chamber of Commerce Advisory Board. PSHH has had a presence in Ventura County for nearly 30 years, originating with self-help housing projects in Moorpark and Piru, continuing with the renovation of the landmark El Patio Hotel in Ventura and ongoing with the property management provided to the resident-run board at Rancho Sespe. Served by an administrative office on Main Street in Ventura, the organization has a number of multifamily housing projects in the pipeline, all set to provide more affordable housing for the area soon.